With one billion monthly users (and growing), YouTube's popularity is a pretty clear indication that video is a powerful medium. And kids' unrelenting fascination with videos is motivating many educators to find ways to leverage them for all kinds of purposes. But the best ways of using videos are not always obvious. Teachers want to know: Among all the millions of videos out there, how do you find the great ones? How do you evaluate the quality of a video? Who are the great content creators, and what are the best curation sites? Which kinds of videos work as fun supplements, and which are best for actual instruction? How do you get students engaged in discussion after watching videos? How do you blend videos into your curriculum? 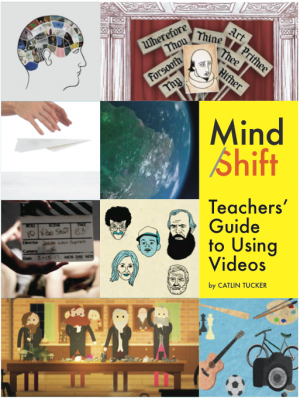 In collaboration with educator Catlin Tucker, MindShift presents Teachers' Guide to Videos [PDF], to answer these questions and more. You'll find a slew of valuable resources, including video links for all kinds of subjects -- history, math, science, language arts, and more -- and ideas on how to inspire students to use videos as a conduit to dig in, ask questions, and learn.